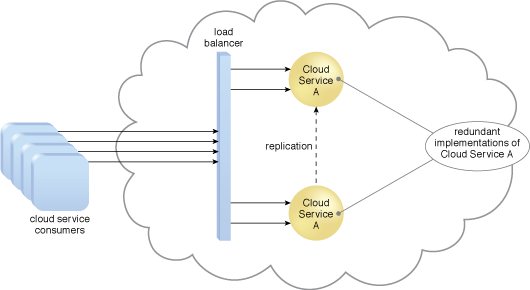 Figure 1 – A load balancer implemented as a service agent transparently distributes incoming workload request messages across two redundant cloud service implementations, which in turn maximizes performance for the clouds service consumers. A load balancer is programmed or configured with a set of performance and QoS rules and parameters with the general objectives of optimizing IT resource usage, avoiding overloads, and maximizing throughput. The load balancer is typically located on the communication path between the IT resources generating the workload and the IT resources performing the workload processing. This mechanism can be designed as a transparent agent that remains hidden from the cloud service consumers, or as a proxy component that abstracts the IT resources performing their workload.